Although the big part of the discussion on the Italian budget law has gravitated around the citizenship income and the pension system changes, the Italian Budget Law for 2019 contains some provisions that so far had less resonance but that could have positive impact on the Italian economy, although some challenges remain on the implementation front. The new budget law includes a set of provisions that attempt to provide some boost to SMEs capex investment and support to the modernization of the manufacturing sector. They also look aimed at promoting the development of additional channels for company financing (e.g. venture capital), in line with the trend in other countries, by trying to set the conditions to convey more funds in these vehicles. These developments represent an interesting attempt to bring Italy in line with the international landscape, albeit some obstacles remain. On the one hand the domestic and global economic juncture, which is not the most favourable one for new capex investments; on the other hand the need of changing in a consistent way the regulatory framework to support the implementation of the new law, especially with regards to investment vehicles rules. Overall, implementing measures will have to be approved by end of April 2019 for some of these laws. In the past, we have stressed the importance that we think the measures of the plans related to Industry 4.0 had (together with a positive economic juncture in 2017) in boosting Capex Investments, in particular equipment investment, in Italy. We also stressed the importance of reaching not only medium and big size companies, but also smaller-size companies, in order to deepen the transformation in particular in the Italian manufacturing sector. It is therefore interesting the spin that the Budget law is now giving to the fiscal incentives: while maintaining the rationale of Industry 4.0 plan, few changes overall shift the balance in favour of SMEs. We highlight here few measures that we think are worth mentioning. Extension into 2019 of hyper-amortization to buy capital goods (as defined by previous budget laws) with some changes in the thresholds which favour small and medium companies (SMEs), albeit it does not preclude bigger companies to access incentives for a fraction of their investments. The hyper-amortization rates in fact inversely change with the size of the investment, while super-amortization for new capital/equipment goods disappears from 31 Dec 2018. In this sense, the measure shifts the focus from bigger companies, who benefitted in the past of the fiscal incentives, to SMEs, with the potential of reaching in a deeper way the economic productive structure given that SMEs are the backbone of Italian manufacturing industry. Extension of New Sabatini Law till 31 Dec 2019, refinanced with 48mn in 2019, 96k in 2020 to 2023, 48k in 2024, to make PMI access to credit somewhat easier. The law is aimed at supporting micro, small and medium enterprises providing more favourable credit conditions to finance investments in new machinery, equipment, plant and equipment, included capital goods within the perimeter of Industry 4.0, and to provide a State support for interest expenditures for leasing or credit lines for investments in capital goods/new machinery. 30% of the funds are dedicated to micro and SMEs finalised to Industry 4.0 plan. Tax credit on human capital formation (financed with 250 mn €). Initially not included in the law, it was introduced as a complementary measure to possibly potentiate the effects of the Industry 4.0 plan, to form employees to use new production systems. The annual max expenditure is 300k for SMEs and 200k for medium-big companies. The credit is 50% for small, 40% for medium and 30% for big companies. Voucher for SMEs and business networks who access consulting firms (referred as “digital manager” measure) to introduce digitalization and new technologies in the company activity, as per the Impresa 4.0 framework, and aimed at extending innovative organisational models to SMEs. Digital managers are listed in a register at the Ministry of Economic Development. Creation of two funds (15 mn € each) for private and public projects at national level on artificial intelligence development and blockchain, internet of things; developments strongly supported by the EU Commission. On the economic front, fiscal incentives may be a powerful tool to boost economic growth via new investments and support a change in productivity, competitiveness and potential growth; yet, they need to be supported by business confidence and in this sense, domestic and external economic conditions are key. We are wary that the current economic juncture may be not the most favourable in this respect, as we are expecting further deterioration, at least in the short-term, for domestic and external growth, and at least for major trade partners. So part of the positive effects coming from these measures could be offset by a dampened optimism, but should be supportive to growth nonetheless. Increase allocation of resources to SMEs and Start-ups IPOs, Venture Capital funds and innovative Start-ups. The recently approved 2019 Budget law introduces several modifications to the legal framework that, by incentivizing the investment of some investment vehicles into private equity, venture capital, innovative start-ups tries to achieve a two-fold goal. On one side, trying to develop a funding channels for SMEs alternative to banks, and this is particularly important for the early stages of funding of innovative start-ups. On the other, trying to develop the Italian venture capital market, which is lagging compared to other markets, shifting at the same time from debt to equity funding. The initiative aims to help the Italian economy by trying to convey capital into small businesses and innovative start-ups, a commendable intent for a sector that enjoys modest capital flows in this phase, so it represents naturally an upside potential for the Italian economy, especially in combination with the fiscal incentives to capex. Yet, for defining the size and timing of the impact, it is essential to understand the practical and technical aspects that will define the applicability of the new measures, and this is still in part work in progress. In fact, in order to be effective, these new framework will need to be detailed in implementing measures, to be approved by end of April 2019 at the latest. Introduction of the “Fondo di Sostegno al Venture Capital” (Venture Capital support fund) under the direct supervision of the Italian Ministry of Economic Development, funded with €30 million in 2019,2020,2021 and €5 million from 2022 to 2025. Legal authorization to the Italian Ministry of Economic Development to allocate funds on the venture capital funds or funds of funds (investing in venture capital). Legal authorization to Invitalia to dismiss minority or controlling stakes under the condition that the new investor deploys additional capital. Mandatory investment of at least 15% of the dividends of the dividends distributed by companies participated by the Ministry of Economy and Finance will be invested in VC funds. In case of investments in Innovative Start-ups (as defined by the Italian Startup Act) the budget law provides for FY 2019 to investing Individuals and Companies a tax deduction increased from 30% up to 40%. If a company operating with any legal framework different form a start-up acquires the whole capital of an innovative start-up, without reducing its stake for at least three years, the fiscal incentives becomes 50% (previously 30%) of the invested capital. The introduction for 2019 of a tax deduction of 40% (previously 30%) for equity investment on innovative start-ups for companies and private investors. Additionally, the introduction of a public record of Business Angels within the Bank of Italy. It is considered as Business Angel any person, not operating on behalf of any legal entity, which invests professionally at least €40 thousands on a three-year horizon on Italian start-ups. Fiscal incentive: the Flat Tax framework (15% tax rate or 5% for new activities) for taxpayers with less than 65k includes also the work of equity subjects all those professionals investing e.g. in Innovative Start-ups. Within the framework of measures to attract human capital, it is worth mentioning the proposal under discussion to extend the applicability of fiscal incentives for Italian workers returning to work in Italy after a period of abroad to a broader pool. This for instance, could make eligible those who have formed a new business, a so-called "start up", willing to bring their business back to Italy. Pension funds: quota of allowed investment in Italian and EU resident Venture Capital funds increases up to 10% of each pension fund assets, allowing for greater capital allocation into this type of instruments. PIRs (Long Term Investment Plans): mandatory allocation of 3.5% of the capital raised through to MTS (e.g. the small cap market AIM) and 3.5% to venture capital funds. 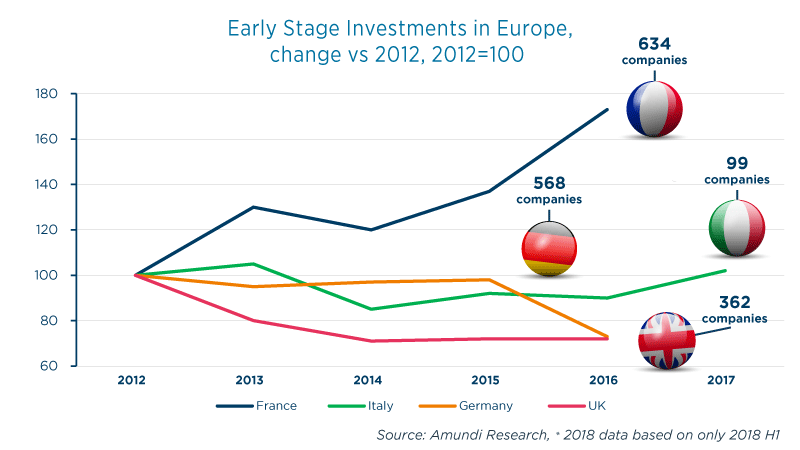 Looking at the data available for the Italian market it is evident how the incentives to the development of the venture capital market would be potentially beneficial. In fact, only approximately 10% of the fundraising of Private Equity and Venture Capital Italian funds is conveyed to the early stage phase of investments, where the number of deals (data as of H1 2018, including domestic and international funds) has been increasing over time as well as the size. Yet the Italian market remains under-developed compared to the European context. According to a AIFI report, in 2017 the Italian total fundraising (private equity and venture capital) has been 5bn euro against 92 bn in Europe (i.e. little more than 5%). Major contributors to the development in Italy are individual and family offices, while institutional investors such as pension and retirement funds had a minor role.